We wrote awhile back on the construction and revitalization that overtook the bottom of Press St for the past year. For months, the area was swamped with construction detritus: bobcats, bulldozers and such. Still, as construction sites go, the area never seemed to steam off the Bywater and Marigny residents who lived on either side of the tracks – maybe because the trains that trundle down the Press St tracks have always been more of a hassle than any one construction project. There was another reason this site didn’t bother anyone: the construction felt on schedule, and what they were building was widely seen as an unambiguous improvement to an otherwise overgrown stretch of weeds and railroad track. I was able to poke around the finished Press Street Station this weekend, and it’s nice to report that the whole finished project is gorgeous. First: that overgrown stretch of weeds is being landscaped into the Press Street Gardens. 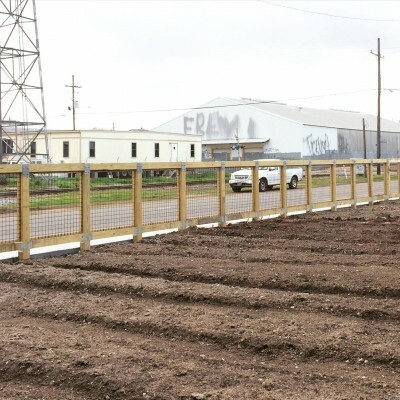 Where once there was scattered trash and debris, now you can see the early frame of a greenhouse and freshly tilled soil beds awaiting planting from the students at the New Orleans center for Creative Arts (NOCCA). The plants those kids put in the ground (with an assist from groups like Parkway Partners) which will supply the larders of the Boxcar food truck and Press Street Station itself. The latter has evolved into a restaurant with one of the most attractive interiors in New Orleans. It’s the perfect interior for a NOCCA project that seeks to teach culinary arts students the ins and outs of operating a restaurant. There’s a god mix of exposed brick, sleek industrial aesthetic and tons of natural light pouring in the floor to ceiling windows. 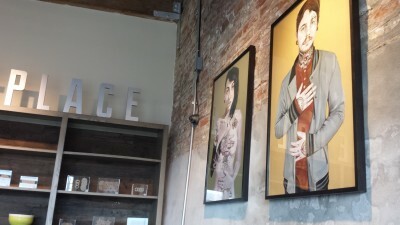 NOCCA artwork is posted on the walls, and the whole place feels like a hybrid gallery-cafe. The thing about those sorts of institutions is they’re generally super pricey. Not so Press Street Station; most of the menu, made from locally sourced ingredients, is priced under $10. The most expensive entree is the grilled shrimp tamale ($13), which I ordered. It is, hands down, the best tamale I’ve had in greater New Orleans (if you’re from out of town, don’t smirk; tamales are a big thing in South Louisiana, and there are a lot of tamale stands scattered across the area). The shrimp has a mesquite-y burn, just fiery enough to get my tongue excited, but not so hot that I felt the need to rush for a glass of iced tea. My partner ordered the tostones with braised chicken and fresh cilantro sour cream served with poached eggs. Everything was delicious, although the eggs were over-poached; we chalked this up to the student chefs. Maybe that’s an enabling excuse on our part (and maybe it had nothing to do with a student chef), but we were in a forgiving mood. Most importantly: I have the sense that if we had sent the eggs back the kitchen would have redone them with a smile, because service was gracious, sharp and quick. Afterwards, we wandered around the extended Press Street Station campus. There’s an art gallery on site, and a few other rooms utilized by NOCCA and, ere go, filled with cool, creative stuff. So the next time you’re crossing from the Marigny into the Bywater, don’t pass the tracks without pausing. Pop into Press Street Station, support a public school, its students and a community garden, and eat a fine meal while you’re at it. That’s a good day in anyone’s book.